The spinal column (Fig.1) is comprised of boney structures called vertebrae .There are seven cervical (neck), twelve thoracic (chest), five lumbar (low back) and five fused sacral (pelvic) vertebrae. 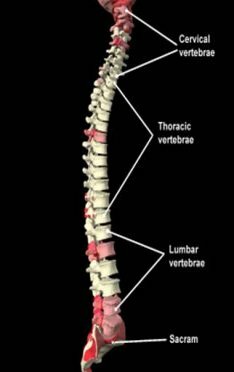 The vertebra act to provide protection of the spinal cord, attachment points for muscles, ligaments, tendons and structural support for the head, shoulders and chest. Most of the vertebrae of the spine are cushioned with structures called intervertebral discs (Fig.2). The intervertebral discs are gel filled fibrocartilaginous materials that act as shock absorbers. 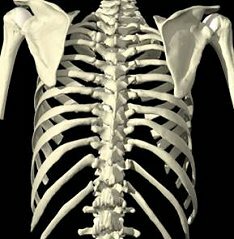 The rib cage (Fig.3) is attached to the thoracic vertebrae from T-1 to T-10. The ribs at levels 11 and 12 do not attach. The ribs serve as protection for the internal organs. In addition to the discs the surfaces of the vertebrae and the facets are covered with the same articular hyaline cartilage found in all the moveable joints found in the body. This material helps to dissipate the effects of loading and provides a smooth surface for movement with limited friction. Ligaments connect bone to bone. 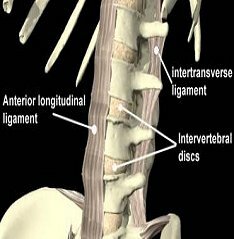 The most important ligaments of the spine are the anterior longitudinal ligament (Fig. 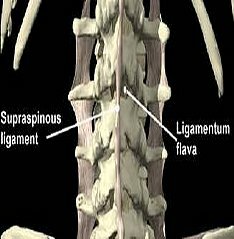 2), the ligamentum flava (Fig. 4) and the posterior longitudinal ligament. These ligaments provide structural stability and restrict excessive movements. The 30 spinal muscles offer support, stability and provide mobility of the spine. 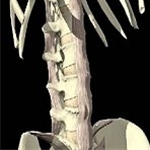 Like all muscles, the spinal muscles react to nerve impulses to contract and rest. 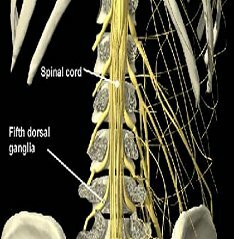 There are thirty one pairs of spinal nerves emerging from the spinal cord through openings in the spinal column (Fig.5). These nerves activate muscles throughout the body. Offering a variety of back treatment braces for degenerative disc disease. Read more..
Shop braces and supports for lower back pain. Wearing a lower back brace may help prevent an injury from occurring. Read more..
Shop braces and supports for herniated disc. Wearing a herniated disc back brace may help prevent an injury from occurring. Read more..
Shop braces and supports for back pain. Wearing a back brace may help prevent an injury from occurring. Read more..
Buy Direct from US Manufacturer Sacroiliac Orthosis Leave surgery for Sacroiliac Ligament Inflammation behind...? ?Our SI Belt has been designed for the conservative treatment of SacroiliacInflammatio Read more..